When you need a quick music mix, the temptation to fire up iTunes can be tough to resist. But a dedicated DJ app will give you more advanced features that make playing music more fun—and fun is what DJing is all about, right? While advanced apps such as Native Instruments’ Traktor Pro certainly fit the bill, for many users they’re overkill and over-budget. Many people are just looking for a tool that combines iTunes’ playback library with the basic tools for mixing, scratching, effecting, looping, and sharing music. And for that purpose, you’ll have a tough time beating Algoriddim’s Djay. Surprisingly, more-serious users may want it in their arsenal, too. The interfaces of most advanced DJ programs resemble airplane cockpits. Djay’s visual presentation, by contrast, is immediately understandable—imagine iTunes if it had been created for DJing. 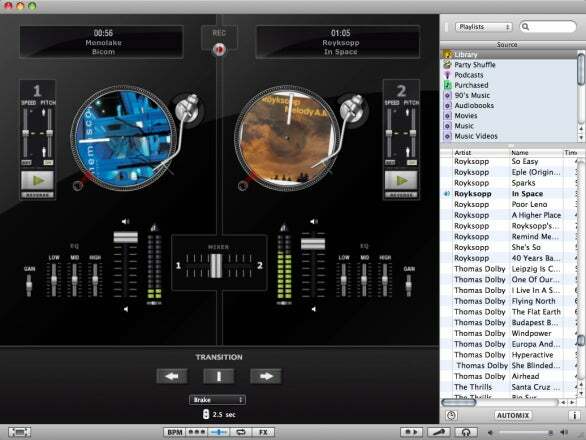 Djay’s main screen has two virtual turntables separated by a crossfader, with play, reverse, speed, pitch, EQ, and volume settings for each deck. To the right of the turntables, you see your iTunes library, browsable by playlist or searchable. For some, this functionality alone will be worth the purchase price. But regardless of your user level, Djay provides powerful features as you dig further in. Basic operation couldn’t be simpler. Pick a track, drag it to one of the decks, and the turntable spins to life, even displaying the track’s album art on the virtual record. (It’s fun just watching your album art spin around.) Most of what you can do with a real deck, you can do with Djay’s decks: You can stop and start a deck by clicking on the “record,” and you can skip to different parts of a track by moving the tone arm. Drag the record, and Djay simulates scratching; even better, if you’re using a Mac laptop, you can scratch using a two-finger trackpad gesture. Djay even mimics the momentum and inertia of a deck. Djay's interface mimics basic turntables and DJ hardware, with easy access to decks, EQ, and crossfader—plus pretty album art from your iTunes collection. For beginning users, or for unattended mixing, Djay includes a number of “autopilot” features. You can transition automatically between tracks, optionally adding pre-defined effects such as backspin and echo. The effects sound good and can be a lot of fun, though they do get a bit repetitive after a while, even when randomly-selected. You can also add backspin and forward-spin effects while playing a track. If manual beat matching isn’t your style, or your area of expertise, there’s a tap-tempo function. By clicking the Tap button along with a track’s beat, the software can calculate the tempo in beats per minute (BPM). Plus and minus controls allow you to manually adjust playback speed for each deck, and a Sync button is intended to automatically align one track’s tempo to the tempo of the other deck. In practice, I found this arrangement a bit tough to use, especially given that there isn’t a “nudge” control for shifting one track forward or backward relative to the other. I wound up manually adjusting tempo, and even then, the result was an approximation. Then again, if you need advanced auto-beat-matching features, you probably want a more-advanced tool than Djay. Djay also includes some great mix-sharing and export features. You can record your mixes, export playlists to PDF, broadcast online using Nicecast, or mix over a network via Bonjour. These features make Djay well-suited to assembling wedding and party mixes as well as sharing music with friends. 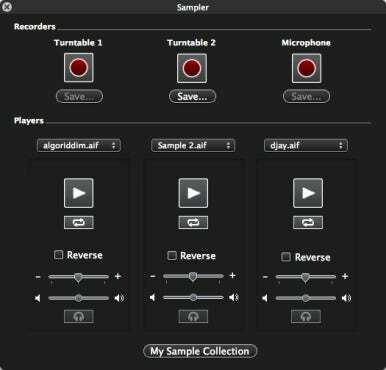 A simple sampler lets you create your own loops from a mic or deck—useful with your own music, as well as for DJing. But what’s surprising about Djay is that you also get a whole lot of advanced functionality: You can undo and redo actions in real time. Decks support cue points for looping, with loop points displayed on the virtual vinyl. There’s a mic input with its own effects, as well as internal effects for the decks. A simple real-time sampler lets you create loops from the decks or a mic. You can even add Audio Unit effects to your mix, although Djay doesn’t display an Audio Unit's user interface, so you’ll have to use plain-vanilla sliders to adjust parameters. Djay also supports cueing mixes through headphones, letting you listen to the track you’re cueing while your audience hears only the actively playing track. Once you’ve got the next track sounding the way you like, you can share it with your crowd by cross-fading it in. To keep the cue and main mixes separate, you need a headphone output that’s separate from your main output. Fortunately, Djay makes setting up two separate outputs easy, even if you’re using a separate piece of hardware for one of the outputs. For example, if your computer doesn’t have multiple audio outputs, you could use the headphone jack for the main mix and connect a cheap USB headset for cueing (or vice versa). On the other hand, beat matching with a mouse is more than a little difficult, though if you add a Vestax DJ MIDI controller, you get tangible control for adjusting the mix and scratching. (Unfortunately, support for other MIDI hardware or vinyl control solutions is missing, so, again, if you need that, you’ll need a more-advanced tool.) And the audio quality of scratching and effects, even at the highest-quality settings, can’t quite match some higher-end tools—though it should be just fine for most basic DJ mixes. As someone who does use advanced DJ tools, I don’t plan on tossing my high-end software, but that’s not really the point. I’ve occasionally wished for something more lightweight—a back-to-basics, hardware-style DJ tool for simpler jobs. Djay fits into that category nicely, providing lots of subtle functionality without being overwhelming. For beginners and music lovers, Djay is simply the friendliest way I’ve seen to have some fun with your music and start to explore DJing. And the timing couldn’t be better: with even iTunes-purchased tracks now DRM-free, you’re free to play your music locally or over networks. The fifty-dollar price is reasonable and even makes the program appealing to advanced DJs as an addition to their setups—crank up the audio-quality preferences and consider adding Vestax controller hardware, and you could easily play some paid gigs with it. I’ll be using it when I need to feed a quick unattended mix between live sets.